Let me tell you something about myself. I love veggie burgers. I often judge a restaurant by three things; their veggie burgers, their grilled cheese and their onion rings. I know they sound like simple dishes, but often, they’re what I turn to when I go out to eat. And if those dishes are not good, uh oh. So I’m always trying out new flavor combinations for veggie burgers at home. It’s a great weeknight dinner and they tend to freeze well for future meals. 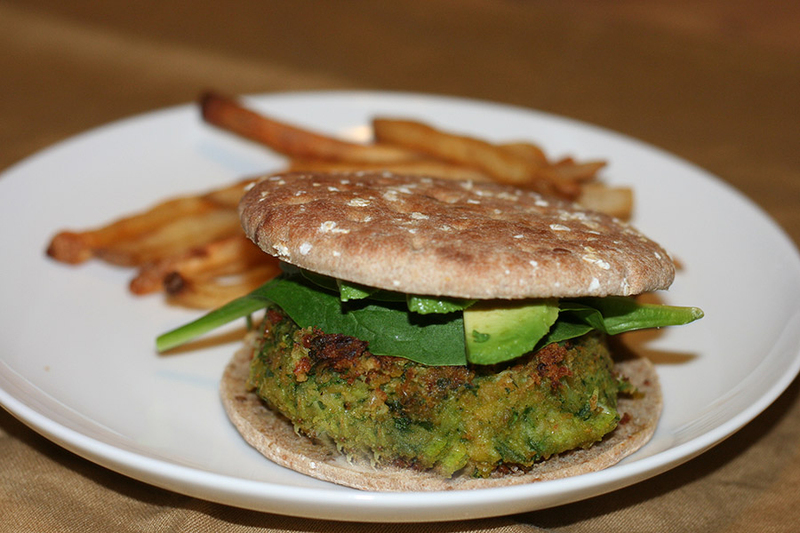 This spinach and chickpea burger fell together. I was in the mood for a falafel flavor without the falafel and the mess it comes with. I needed simple. I also had some spinach I wanted to use up and I didn’t want to turn it in to a salad. I’ve been keeping my Cuisinart food processor out on the counter lately, so these came together super fast. I mixed up a can of chickpeas, an onion, some garlic and the spinach in the food processor. I then added some spices. I formed them in to burger shapes and then lightly fried the burgers in a pan that was coated lightly in olive oil. I just wanted them to brown and hold together. I then placed them in an oven at 375 to finish cooking. I enjoyed these with a salad, while my kids devoured them on a sandwich thin along with extra spinach and sliced avocado and French fries on the side. Hope you enjoy these as much as we did! Mix everything together in a food processor. Form mixture in to burgers. Pan fry in a large sauté pan. Finish cooking in an oven at 375. It should bake for around 10 minutes or so. Serve them dressed with your preferred burger toppings. Enjoy! We were having a get-together with some friends and I offered to bring something over. They suggested soup. I initially thought I would do something simple like my Cardamom Cauliflower Soup or perhaps my French Onion Soup. I wanted to change things up a bit though. 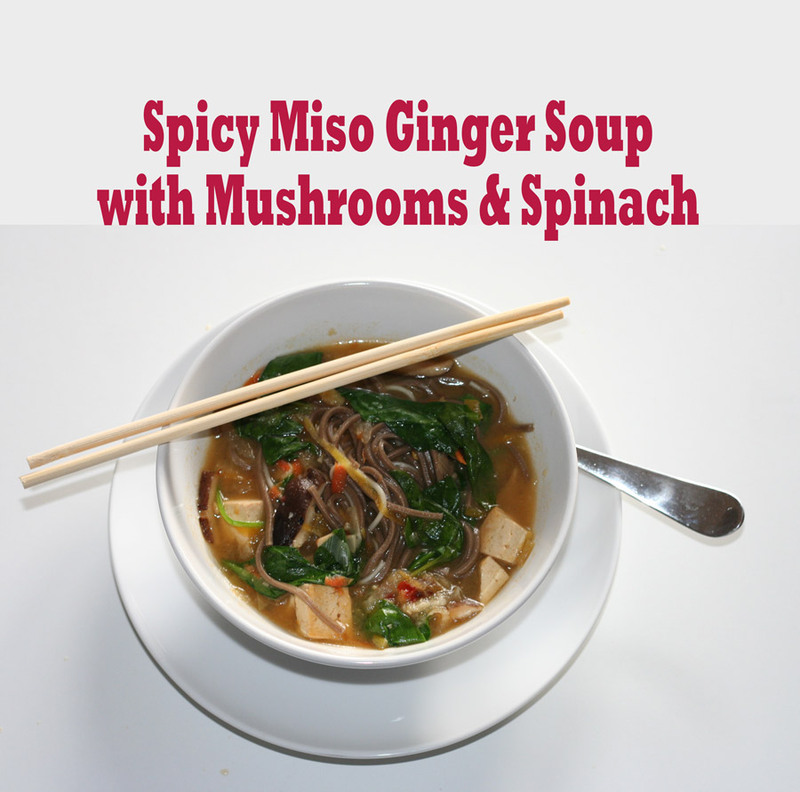 It’s been pretty cold around here and I’ve been craving spicy Asian noodle soups. My Bon Appétit Magazine had just arrived and I was drooling over the rice noodle soup on the cover. Having looked through various recipes for inspiration, I decided to come up with my own vegan soup recipe. I had some miso on hand as well as shiitake mushrooms. I knew I could pull something together. I began by sautéing up some shallots, garlic and ginger in a little bit of sesame and canola oil. As they softened, I added some cubed extra firm tofu and some sliced shiitake mushrooms, along with the whites of the scallions. I let everything sear and soften. The smell coming off the pot was amazing. I stirred in some chili garlic paste and added some vegetable broth to the pot. I then added a strip of Kombu to the broth mixture. Kombu is a type of seaweed that adds amazing flavor to soups. Next, I stirred in some miso and tamari to the mix. I tasted the broth a bit to see if it needed additional spice. I like heat, so I added a couple of squirts of Sriracha. Next, I added some spinach, shredded daikon and shredded carrots. The spinach cooks up fast. At that point, the soup smelled amazing and I really wanted to dig in. I let the soup simmer for about a half hour. I then ladled in to a bowl over some gluten free soba noodles. This soup is perfect. It’s great for these cold winter days. Add some extra sriracha if you want an extra kick. 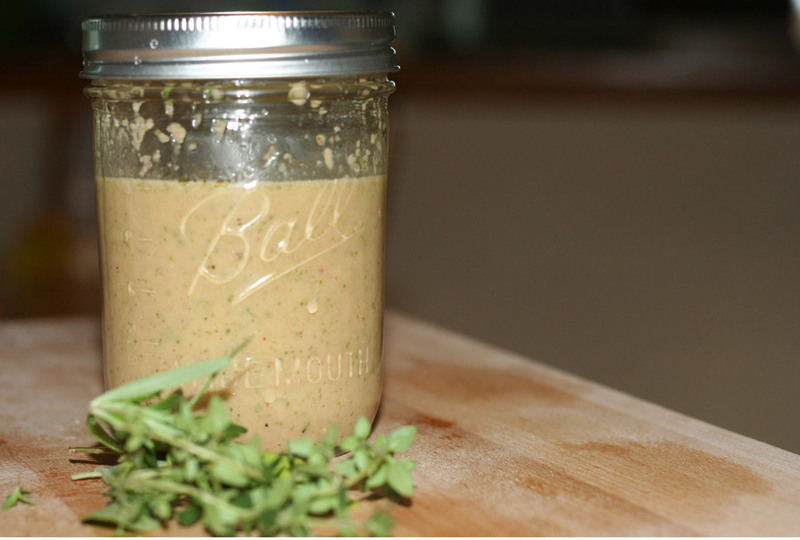 Process the garlic and ginger in to a paste in the food processor. Heat up the oils in a heavy bottom soup pot. Add in the garlic, ginger and scallions and saute for a few minutes to soften. Add in the mushrooms and the tofu and saute for several minutes. Stir in the chili paste and add in the broth. Mix in the miso paste and tamari and taste the soup a bit. Add additional sriracha or red pepper flakes for extra heat. Add in the shredded veggies and spinach and cover the pot. Let the soup simmer for about a half hour. My daughter came home from a friend’s house and excitedly told me all about the Olive Garden soup she had just eaten for dinner. I don’t think I’ve been to Olive Garden since I was about ten-years-old. I definitely didn’t remember any soup. The friend’s family knows that we don’t eat at Olive Garden and they understand that Gila is a vegetarian. After a moment of panic, I composed myself and asked her to tell me more. 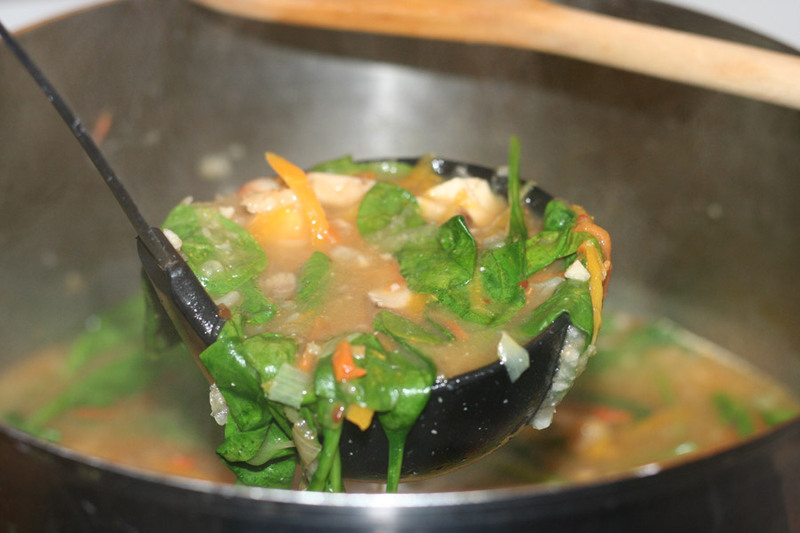 She happily told me about this amazing soup filled with spinach, potatoes and delicious broth. For days after, she asked me if I had made my version of the soup yet. I had just finished a marathon soup cooking session. My freezer was already bursting with various soups. I wasn’t ready to make another soup. As they often do, circumstances change. In the middle of the work day, I quickly texted my husband and asked him what he thought I should prepare for dinner. With a groan, he told me all about his two root canals from earlier that morning and then fast forwarded to the part where he told me that all his jaw could handle was some warm soup. He told me not to worry. He assured me that he would just venture out to a local take-out place and buy something. I couldn’t let that happen. I decided that this was the night to make the soup of Gila’s dreams. I had some kale in the fridge that needed to be used up. I decided that it would be perfect in place of the spinach. I also had a ziploc bag of already cooked white beans in the freezer. 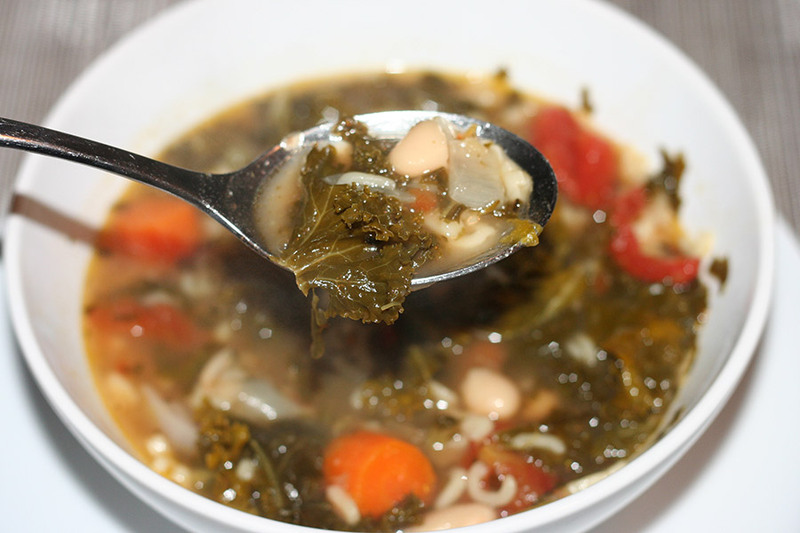 I set off to make my version of this Olive Garden Soup. Amazingly, I was successful. Gila went to bed with a full and happy belly and Jason happily had three bowls of soup. 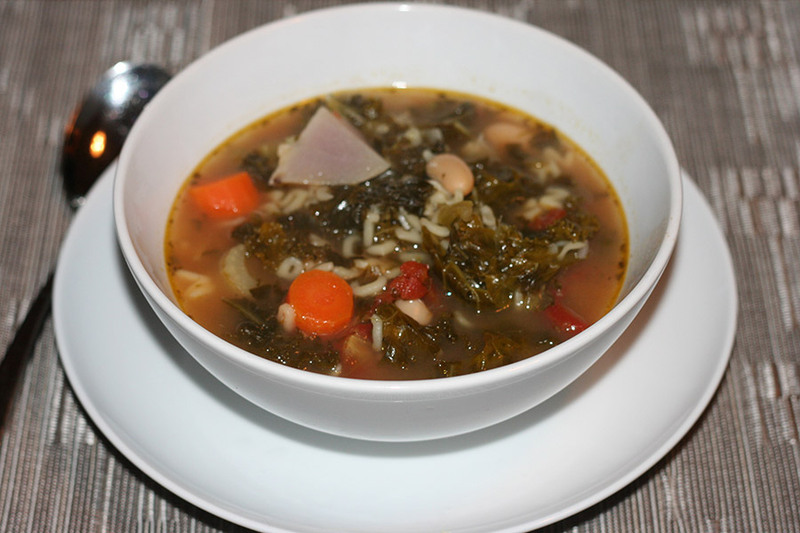 This hearty soup is a winner and will definitely be made again! Add in the onions, carrots, celery and garlic and cook a few minutes to soften. Turn the heat down and let simmer while covered for at least an hour. 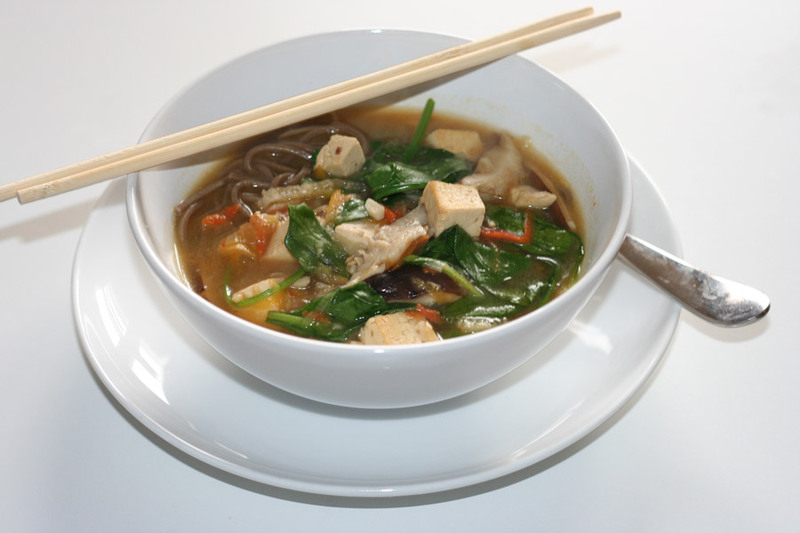 If you'd like some noodles in your soup, add them about 15 minutes before serving. It may be shocking to see me posting a meat recipe. It happens once in a while. It’s grilling season. You got to cook up some burgers during grilling season! When I do buy and cook meat, I like to know that my meat is coming from a good place. Kind of like the chicken on the Portlandia episode. Well, I’m not that intense. I do like to know though, that the animals were treated well and fed well. I prefer to only buy sustainable, pasture-raised and grass-fed meats when possible. That’s where KOL Foods comes in to play. They have an amazing selection of pastured and grass-fed meats and poultry. You can read more about them here. They recently sent me some beef bacon and ground turkey. I was so excited when the meats showed up. I had a few things in mind as to what to create. Being that July 4th, Independence Day, is almost upon us, I thought I would share a treat that’s perfect for your family barbecues. 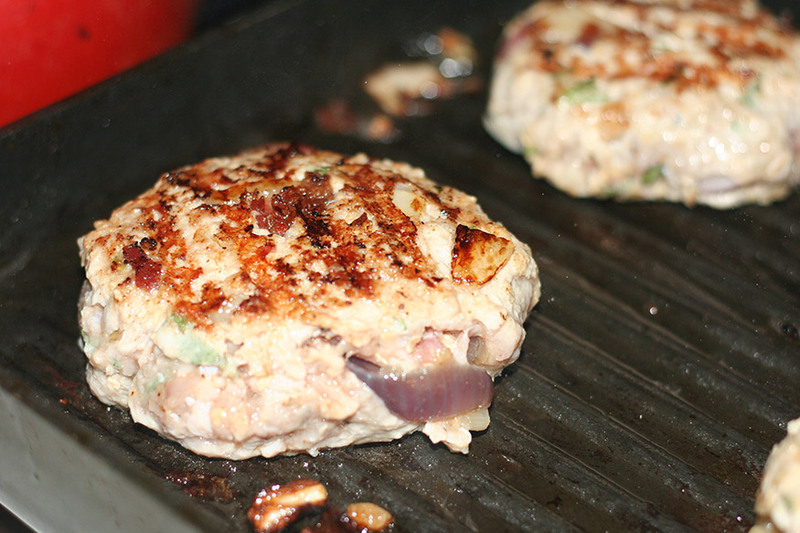 These bacon and onion stuffed turkey burgers come together fairly painlessly and you will reap the rewards with the amazing flavor. Earlier in the day, I stepped on to my deck to pick some herbs for my burgers. I like using sage, rosemary, parsley and thyme whenever I mix up some burger meat. 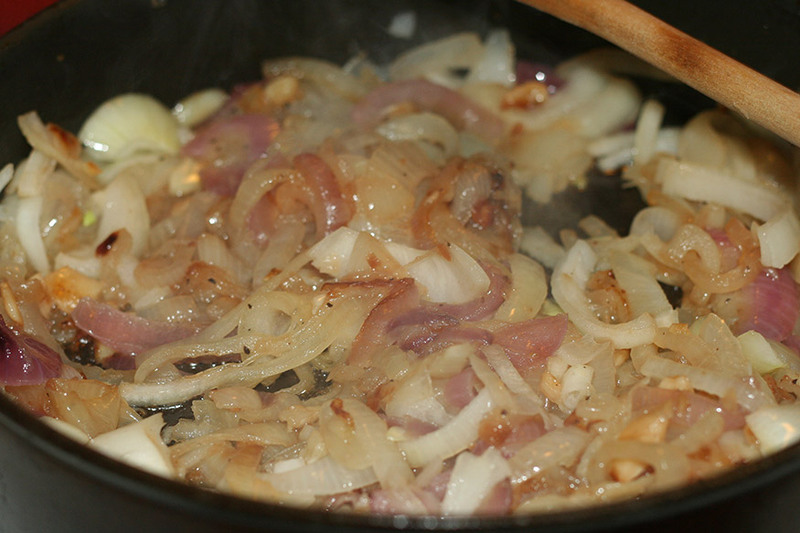 In one pan, I began to caramelize some onions and garlic. I love caramelized onions both on and in the burger. In another grill pan, I began to fry up the bacon. Half of the bacon was reserved for garnishing the burgers, but the other half would be going in the burgers. I let both the bacon and the onions cool a bit. In the bacon pan, I sliced up some portabello mushrooms and grilled them. I began to mix up my burgers. 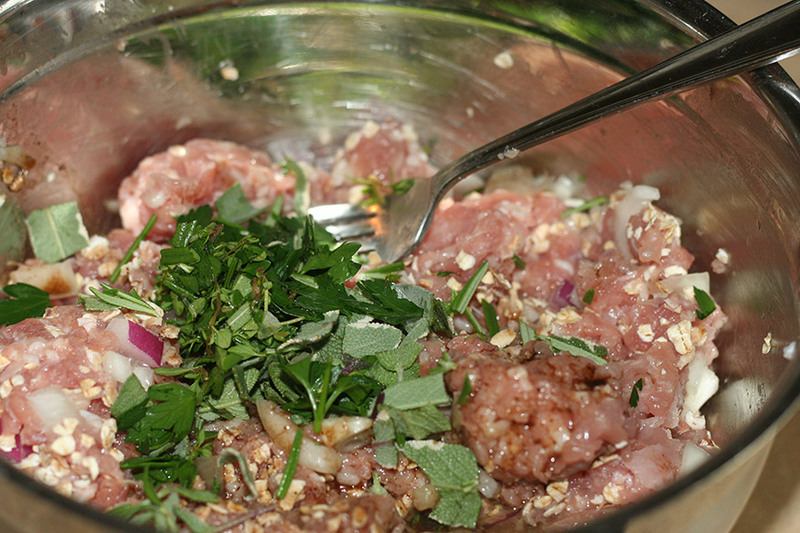 I mixed the ground turkey with chopped onion, garlic, salt, pepper, rosemary, parsley, thyme and sage. I then added some gluten free oats, vegan worcestershire sauce and an egg to the mix. I mixed everything well. If you are not gluten free, feel free to add some bread crumbs or panko crumbs instead. I wanted to keep these gluten free for me. 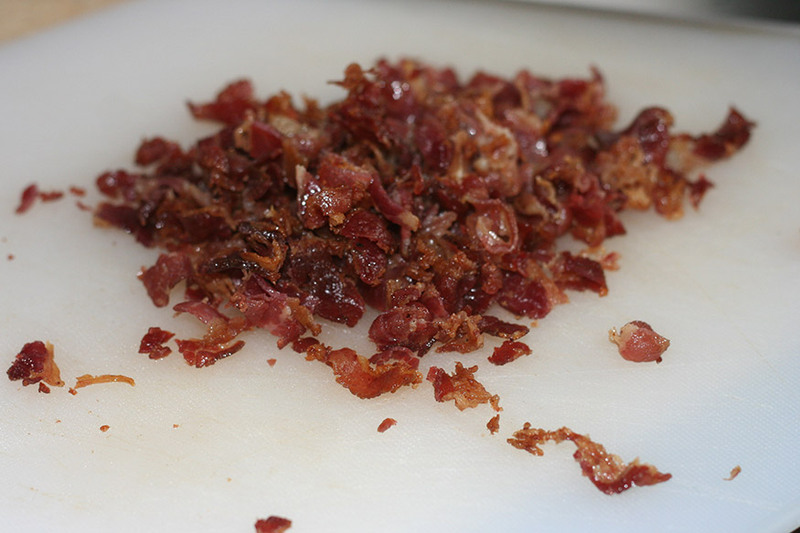 I crumbled up half of the cooked bacon. 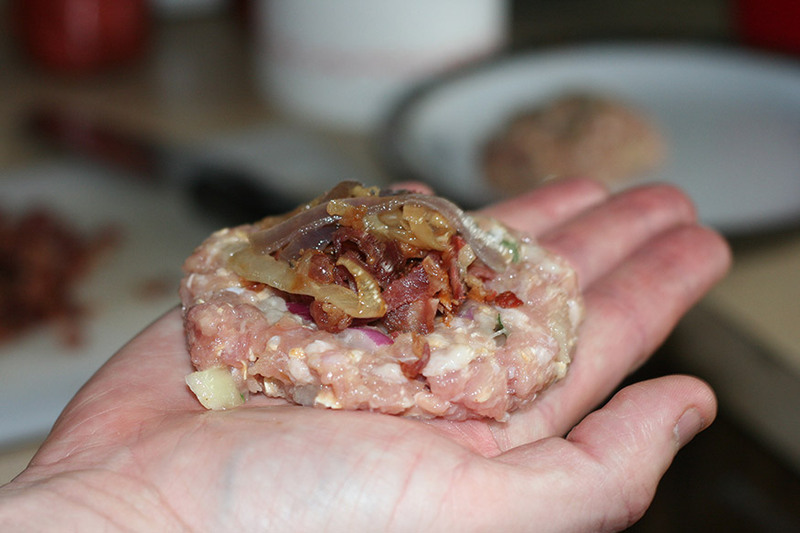 I formed some of the burger mixture in to a patty and then placed about a tablespoon of chopped bacon and a tablespoon of onions in the center of the formed patty. I then placed more of the burger mixture over it and sealed the bacon and onions in. I managed to get 7 burgers out of this mixture. 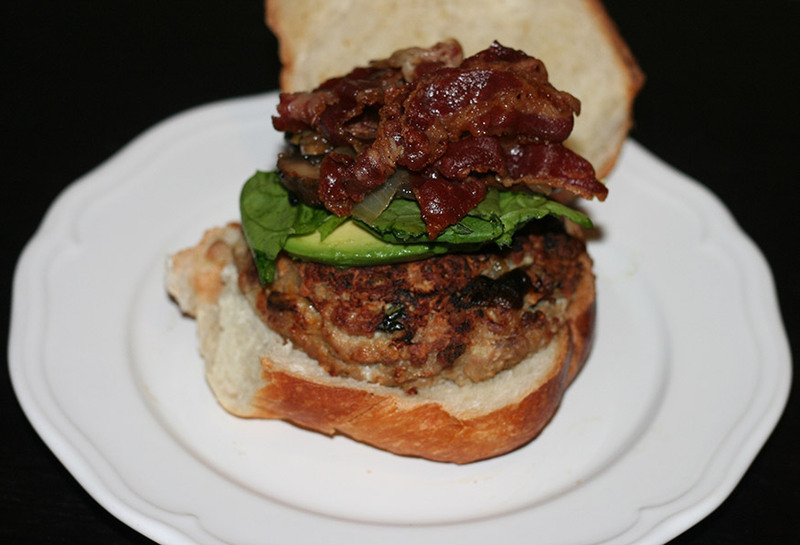 I served up the burgers with additional bacon, onion, mushrooms, spinach and avocado. Oh my. That burger was amazing! You must make it! As far as KOL Foods goes, they are amazing. I found that the meats and poultry are much more flavorful than the traditional store-bought varieties. The turkey tastes like turkey and the no-nitrite bacon was incredibly flavorful. I really loved the meats I received from them and am excited to order and cook from them again soon. Thank you, KOL Foods! In one pan, heat up some olive oil. Add the onions, garlic, salt and pepper. Cook on medium until the onions are caramelized. Set pan aside when done. In another pan, cook the bacon. 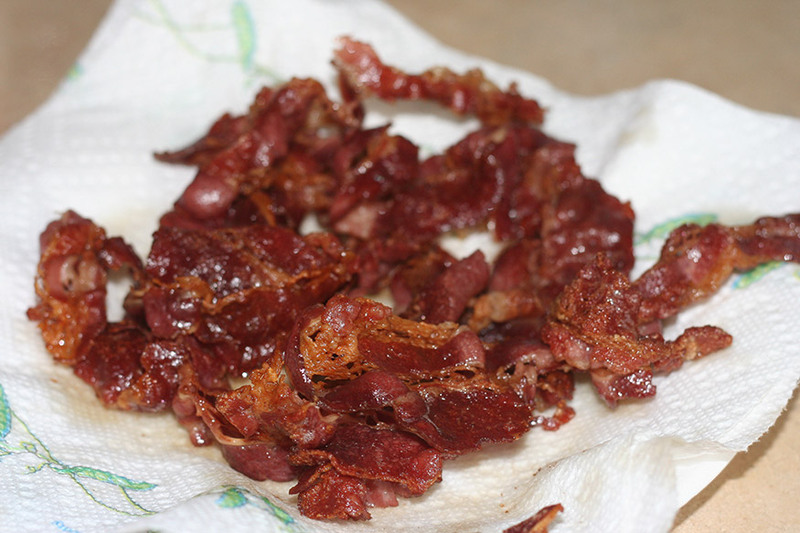 Because the bacon is fatty, you don't need to add any oil. Cook the bacon until crisp. Drain on paper towels and set aside. In that same grill pan, grill the mushrooms until nicely browned. Set aside. Crumble up half of the bacon. In a mixing bowl, mix up the ground turkey with the fresh herbs, the egg, the oats or bread crumbs, the worcestershire sauce, salt and pepper. Form the burger in to a small patty. Place a tablespoon of the crumbled bacon and the caramelized onions in center of each patty. 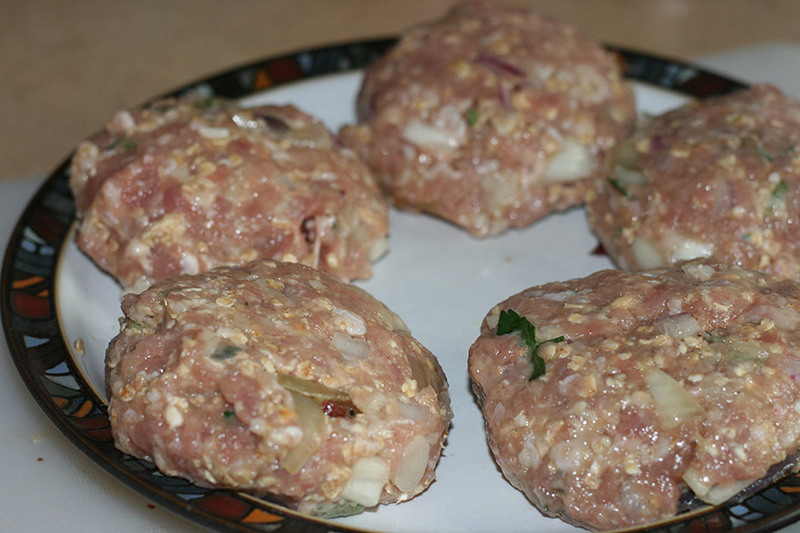 Top and seal with additional burger mixture. Cook burger on a barbecue or on a grill pan until done. Top with your favorite burger toppings. I never used to be a salad person. I would eat it and enjoy it, but I never really sought it out or really appreciated it. It wasn’t until I couldn’t eat salad that I started to crave it and get more creative with salad. Crohn’s has kept me away from raw vegetables on and off at different spurts in my life. So here I am now, Crohn’s free, and taking full advantage of this lull in my life. Summer has come on with full force and with that, we have some beautiful veggies showing up in the markets. Baby spinach is one of my favorite greens. You may have noticed that it shows up in some of my favorite dishes. Since it’s summer time, I like to eat more fresh dishes that don’t require heating up the house. 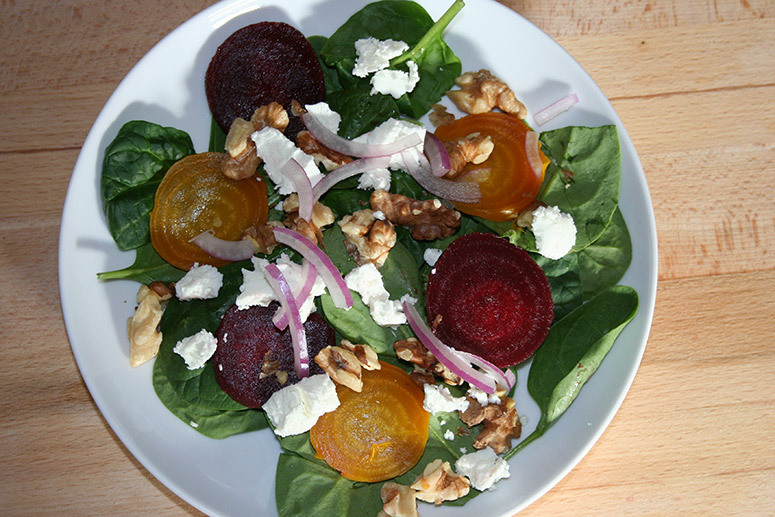 I think it was my sister that introduced me to this Spinach and Beet Salad with Chèvre and Walnuts. I ate it on one of my visits back home to Minneapolis. Since then, I order this salad on whatever menu I see it on. I decided to make it myself. I had recently received some beautiful beets in the CSA and I had everything else in the fridge. The spinach I used in this salad was prewashed and ready to go. I roasted some beets and I toasted some walnuts in the oven. I served the salad with a red wine, basil and shallot vinaigrette that I quickly whipped up in my Cuisinart Mini-Prep processor. Trim off the ends of the beets and place in foil. Sprinkle olive oil over the beets and sprinkle with salt and pepper. Wrap in the foil. Roast the beets in the oven for about 40 minutes. Remove from oven and cool. While the beets cool, place the walnuts on some foil and toast in the oven for about 5 minutes. When cooled down, slice the beets thinly. 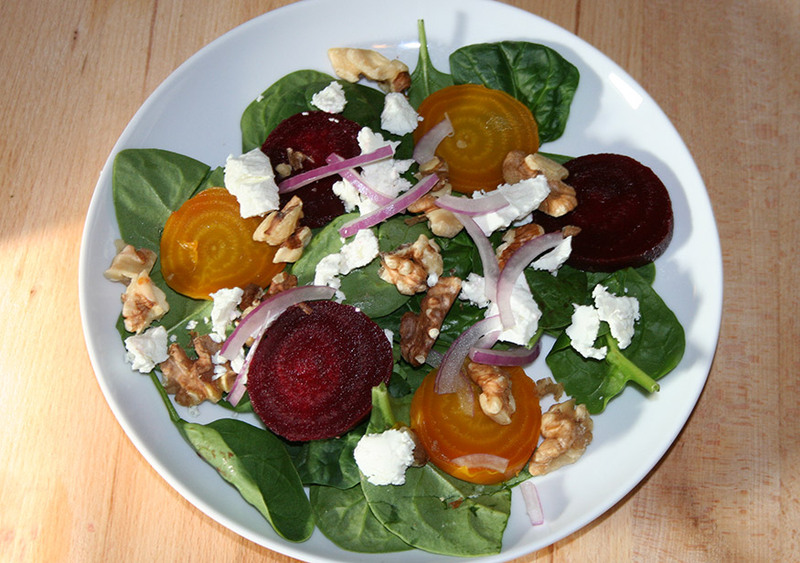 Layer the salad - first the spinach, then the beets, then the onions and walnuts, then the goat cheese. Sprinkle on a dressing of your choice. I would recommend a red wine vinaigrette. Place everything except for the olive oil in to the food processor. Slowly pour in the olive oil and let the mixture emulsify. Transfer dressing to a container. Enjoy on your favorite salad. I need to begin by telling you something. I just have to get it off my chest. This recipe came about by accident. It was a happy accident. It was one of those nights where all of my well thought-out dinner plans were tossed out the window due to unforeseen circumstances. A rain storm, some traffic, a dying fridge. Everything contributed. Somehow though, things fell in to place. I often keep some precooked protein as a starting block on hand. Be it tofu, seitan or some cooked beans. I had a few cups of cooked French Green Lentils. Further back on the fridge shelf, I noticed a package of Italian Sausage flavored Tofurky. Double score! I was doing better than I thought. It being a chilly and rainy day, my older daughter had a special request for some lentil soup. While I patiently explained that I didn’t have time for soup making, I assured her that the lentils would work well for dinner and that dinner could be on the table in less than a half hour. I began by sauteeing some onions and garlic in olive oil. I then added the faux sausage to brown. After, I added some sliced Baby Bella mushrooms along with the lentils and some herbs. It started to smell pretty good in my kitchen. I then added some canned, diced tomatoes to the mix along with the spinach, and I was just about ready to serve. My kids ate this over some mini-penne pasta, while I had it as-is. I hope you enjoy this dish as much as I did. Heat up the saute pan for a few minutes. Add in the olive oil. Add in the onions and garlic and saute for a few minutes. Add in the sliced sausage and cook for about 5 minutes. Add in the mushrooms and cooked lentils. Cook for another 5 minutes, stirring until mushrooms have softened. Add in the canned diced tomatoes and the spices. Cook for two minutes. Stir in the spinach until wilted. Add in additional salt and pepper as needed. I’ve been meaning to make seared tuna for a long time. Every time I head in to my local fish market, I check to see if they have a nice piece of fresh tuna available. My dad once made a fantastic piece of sesame seared tuna and ever since, I’ve wanted to recreate this dish at home. It finally happened. I wandered in to the fish market and I saw the piece of tuna. This wild caught tuna looked perfect. I asked the shopkeeper to cut it to my specifications and I was on my way. I had everything else at home! Dinner was on its way. With tuna, it’s important not to overcook it. If you overcook tuna, it becomes grey and hard to chew. I prefer my tuna raw, in sushi, but I also love it lightly seared. For my family members that prefer it more cooked, I sear it a few minutes longer for them. Everyone is happy. I marinated this tuna for about 20 minutes and then coated in a sesame crust. After searing and slicing, I served over a bed of wilted spinach, along side some sushi rice. To see the full recipe and more, head on over to This American Bite! Several years ago, I ate a fantastic vegetarian burrito at Benny’s Burritos in the West Village of Manhattan. Ever since then, I’ve been wanting to make something inspired by that dish. The combination of the spinach and tofu with fun spices and cheese, had a fantastic mouth feel that had me craving for something similar. I decided to turn that craving into reality with this enchilada recipe. This was a huge hit, and I wish I had doubled the recipe! Heat up the oil in a large pan. Pat dry the drained and cubed tofu. Add the tofu to the pan. Fry the tofu for 3-5 minutes. Flip over the tofu and cook another 3 minutes. Add in the chopped onion and garlic and cook for a few minutes, until soft. Once soft, add in the baby spinach and spices and turn off the heat. Let the warmth of the other ingredients wilt the spinach. Pour 1 cup of the salsa verde in to the bottom of a 9×13 pan. Place a few tablespoons of the spinach and tofu mixture in to a tortilla along with a sprinkle of the cheese. Roll up the tortilla and place in the pan, seam side down. Repeat with the rest of the tortillas. Pour the rest of the salsa verde over the rolled-up enchiladas. Sprinkle the remaining cheese over the enchiladas. Bake in the preheated oven for 20 minutes. Pour 1 cup of the salsa verde in to the bottom of a 9x13 pan. One of my favorite meals is breakfast, but I rarely give it the honor it deserves. I find it hard to devote time for it. The perfect breakfast for me would be later in the morning, but leisurely. It would probably be a brunch. I don’t have the patience to go beyond the coffee too early in the morning. I love eggs though, and I love other typical breakfast food. I had an abundance of spinach in my house. So, I decided to turn some of it in to breakfast food. I came up with this breakfast casserole. I am so happy with the way it turned out. I had to share it with you. Spray a 9×13 baking dish with the oil spray. Empty the bag of the hashbrown potatoes in to the pan. Sprinkle the potatoes with salt and pepper. Drizzle the olive oil over the potatoes. Bake at 375 for 15-20 minutes or until you see the edges begin to brown. When done, remove from oven. Layer the onions and garlic, then the mushrooms and then the spinach over the potatoes. Layer the shredded cheese over the veggie mixture. Whisk together the eggs with the half & half and the rest of the spices. Pour the egg mixture over the veggies. Bake in the oven at 375 for around 25-30 minutes or until the eggs are set. Remove from oven and serve. Empty the bag of the hashbrown potatoes in to the pan. Sprinkle the potatoes with salt and pepper. Drizzle the olive oil over the potatoes. Bake at 375 for 15-20 minutes or until you see the edges begin to brown. When done, remove from oven. Layer the onions and garlic, then the mushrooms and then the spinach over the potatoes. Layer the shredded cheese over the veggie mixture. Whisk together the eggs with the half & half and the rest of the spices. Remove from oven and serve. Enjoy! I’m always looking for fun ways to use grains in my meals. I am a total carb fiend. Definitely not the best for me, but I love them and can’t stay away. I try to get whole grains in to my meals as much as possible. One of my favorite grains is farro. Farro is a variety of wheat and can be cooked in a multitude of ways, with several delicious outcomes. Around the High Holidays, I cooked up a creamy risotto style farro, which was amazing. More recently, I decided to go with a simpler approach. I wanted a dish that would taste great – both as a room temperature salad and also when served warm, fresh from the stove. This farro dish fits that need. Place the farro in a pot over medium-high heat. Pour in the vegetable broth. Let the mixture come to a boil. Once it’s boiling, reduce the heat to medium low and cover the pot. Check on the farro every few minutes and stir a little. Once all of the liquid has evaporated, fluff the farro with a fork and remove from the heat. Set aside. Heat up the olive oil in a large saute pan. Add in the shallots, garlic, lemon zest, red pepper flakes, salt and pepper. Cook the mixture for a few minutes until softened. Add in the carrots and the mushrooms and cook for a few more minutes. Do not overcook. You want the veggies to have a bit of a bite left. Once the mushrooms are slightly cooked, turn off the heat. Stir in the baby spinach and let it wilt a bit. Take a bite. Add in additional salt and pepper if necessary. Mix in the already cooked farro. Serve warm or cool down and serve room temperature. It’s excellent either way.